PlusServer Review 2019: Is PlusServer a Good Hosting? For two decades, PlusServer has been the go-to cloud hosting provider for large enterprises in Germany, Austria, Switzerland, and beyond. This company is committed to the provision of high-quality hosting services for all of their corporate clients. PlusServer is a cloud hosting vendor headquartered in Germany. They operate out of ten data centers worldwide, seven of which are located in Germany. Their customer base of over 4,000 corporate clients is distributed across 52 countries including the United States, Poland, Bosnia, and Austria. Despite their relatively small customer base, they host about 2,000,000 websites, which is a testament to their quality of service. Founded in 1999, they attained their ISO-27001 certification in September 2009. Their website is currently only available in German. PlusServer delivers high-quality cloud hosting to their customers by availing to these corporate clients several hosting plans packed with great features and capable of managing even the most sophisticated corporate websites. They specialize in providing solutions to medium and large business enterprises, and have achieved noteworthy success within this space. Name any type of infrastructure and chances are that PlusServer can customize a package for you. From on-premise infrastructure to data centers and Microsoft Azure or Amazon AWS, the company offers hybrid hosting solutions that provide business enterprises the right environment for every workload. This in turn makes it possible for enterprises to achieve the highest performance in the most cost-effective way possible. PlusServer’s hosting solutions are designed to offer great services to any medium or large business enterprise on practically any budget. Today, the vendor has a broad array of cloud solutions for their European customer base and has the expertise and experience necessary to meet the regulatory and compliance needs of almost any business. What’s more, this vendor includes other security, performance, and stability measures like load balancers, a global CDN, firewalls, DDoS mitigation, and so on. For businesses that need it, PlusServer also provides a private connection to their dedicated infrastructure. All hosting options under this vendor are extremely flexible and scalable. That said, PlusServer doesn’t include on their website the cost of each of the hosting plans available; all the calls to action are generic with no purchase buttons. To some extent, the website looks like an informational website with no intention of selling any of their hosting solutions; it’s clear that you’ll have to contact them directly to get a quotation for your customized hosting solution. In addition, PlusServer prefers handling big enterprises, so any small enterprise that contacts them is handed over to Nimblu, their smaller hosting services subsidiary. This vendor assures all their customers of direct and personal interactions with their support team, including office walk-ins in their various branches across major cities in Germany. Business executives can contact this vendor via email, a ticketing system, phone, and social media. Their website does not support live chat. The support team can advise you on both their software and hardware. They also conduct round-the-clock monitoring of their hosting infrastructure. The support representative that I spoke with was polite and quite resourceful. He satisfactorily addressed all the issues for which I sought answers. 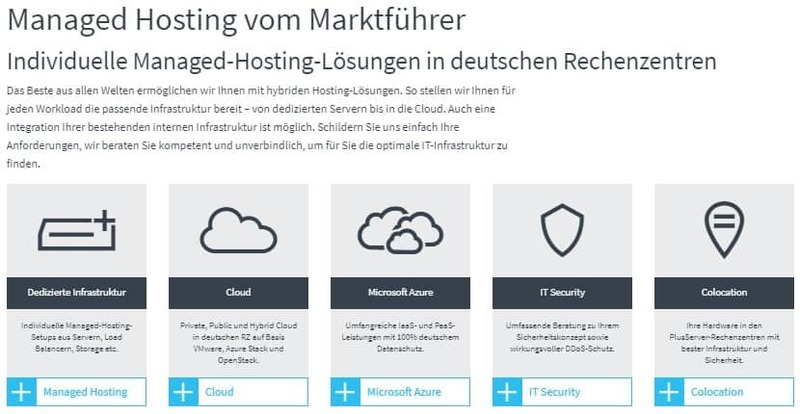 PlusServer provides cloud hosting solutions to large enterprises in Germany and over 50 other countries across the globe. The vendor has an incredibly powerful hosting infrastructure including ten state-of-the-art data centers, making it possible to deliver high performance corporate websites for all their customers. Wondering how PlusServer stacks up against other Web Hosting companies? Enter any other Web Hosting company and we will give you a side-by-side comparison.